This programme is a Qualifying Law Degree (QLD), approved by the UK Solicitors Regulation Authority and the Bar Standard Board. It is the first step for students considering practising law professionally as a solicitor or barrister. 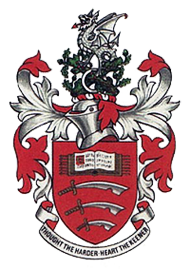 Founded in 1965, the University of Essex is a public university accredited by British Royal Charter, with 3 campuses in Essex, UK. With more than 13,000 students from 130 countries, Essex graduates develop a genuine world view. Experienced – University of Essex high quality online courses are delivered through the “University of Essex Online” since 2007. Courses are available to both UK and international students, which enable you to benefit from a flexible approach to study, while maintaining the quality and support you would expect from a top UK University. The structured online programmes allow you to study for your degree in a unique virtual learning environment and still have access to all the support and facilities you would expect to receive on campus. Study at your own place. Graduate on-campus at UK. No travelling. You can study at your own pace from anywhere; at work, at home or on the move. Everything is done online. You will be invited to attend a Graduation Ceremony at the University of Essex campus in Colchester after fulfilled award requirements. To find out more about the University and online courses on offer, please click here. University of Essex is a recognized British University. Ranked Top 22 in UK (Times Good University Guide 2018). Ranked 2nd Most International University in the UK and 18th in the World (Times Higher Education World University Ranking 2017). Ranked 8th for overall satisfaction among all UK universities (NSS2015). 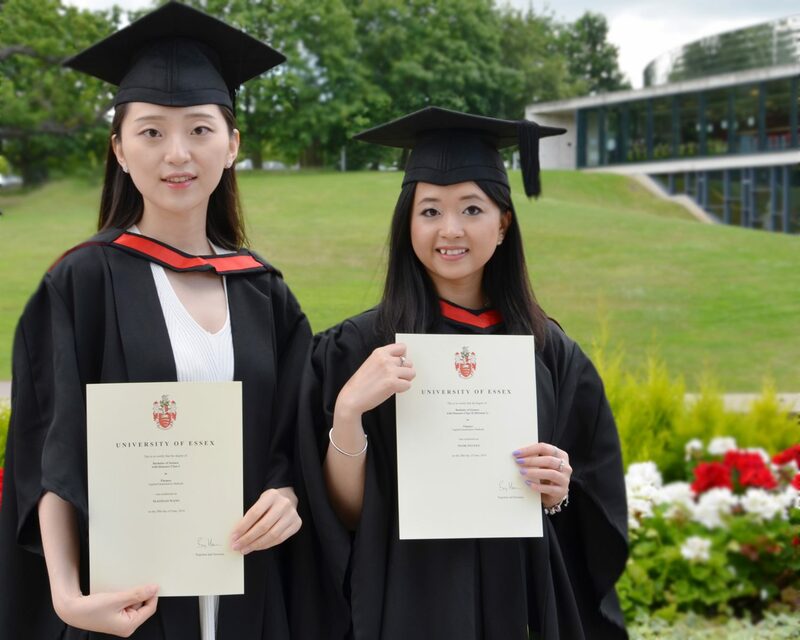 Graduates will be issued with the same University of Essex degree award certificate. There is no mention of online study on the University of Essex degree certificate. The online LLB (Hons) Law degree provides you with a thorough academic training in the discipline of law. It enables you to develop a critical awareness of common law and legal principles, build knowledge of the UK and EU legal systems and gain the analytical and problem-solving skills needed to build a successful career in this dynamic and challenging discipline. You study a wide range of topics and develop your expertise in specific areas of law. Law is a widely recognised and highly respected subject and the knowledge gained will open up many opportunities for you to develop your career both inside and outside the legal field. This LLB (Hons) Law is a Qualifying Law Degree (QLD) approved by the relevant legal professional bodies and is the first step if you are considering practising law professionally. This course is listed on the Solicitors Regulation Authority website as a Qualifying Law Degree (QLD) provider. The course is also relevant if you are an international student wanting to access an English Law programme from a respected UK institution whilst living overseas. The LLB (Hons) Law is made up of the following modules and, upon completion, is equal to a total of 360 credits. † These modules are compulsory and must be passed in order to achieve a Qualifying Law Degree. About 48 months, depending on your own study pace, study options chosen and module availability. – Study duration of 15-credit module: 9 weeks. – Study duration of 30-credit module: 18 weeks. All of the online courses have an indicative study duration which is a guide to how long your course will take to complete. The actual duration may be longer or shorter depending on your speed of study, study options chosen and module availability. It’s possible to complete your studies faster than the indicative course duration by doubling up on modules at certain times; however, minimum study durations do apply. All of the courses have regular start dates throughout the year. The academic year is organised into modules, typically with a one- or two-week break between modules and a structured three-week break for the Christmas period. Students will receive a course timetable during the application process. The university utilise a virtual learning environment instead of a traditional campus to deliver the courses. The system tracks and manages the learning process in real-time and provides you with immediate access to your learning materials. You are supported throughout your course by a dedicated Student Adviser and have the opportunity to regularly interact with fellow students and your tutor. To ensure you receive the support you need from your tutor, the University cap class sizes at 20 students. Student Advisers: All students have a personal Student Adviser who is their first contact point, mentor; provide support and guidance. Experienced Module Tutors: The online tutors have vast experience of delivering both traditional campus and online. They will be in regular contact with students throughout the course, via online virtual learning platform which. Question and answer sessions: They will lead the class by delivering seminars, posting lessons and assignments, answering questions. Feedback on coursework: The virtual learning environment will also be used to mark assignments and provide feedback on coursework. Responding to your questions by phone or email: There is also the opportunity to have regular contact with tutor by telephone and e-mail as you progress through your course and to interact with other students on the programme through online forums. Additional Resources: You will have access to a number of resources to complement your studies via virtual learning platform, such as online libraries, which will enable you to access on-line journals, databases and e-books. An assignment-based assessment approach is adopted, instead of exams. All of your work is uploaded via the online learning platform where your tutor has direct access to assess it. Credit will be considered on a case-by-case basis and may be offered for equivalent level studies. Programme information is correct at time of publish. The University reserves the right to make variations to the programme schedules, contents, information and fees without notice. LLB (Hons) Law degree is one of the most prestigious and well-established professional qualifications. Because of the nature of the course, which is focused on applying legal knowledge in practical circumstances, many people are wondering how can it be studied ‘properly’ online. This LLB (Hons) Law is a Qualifying Law Degree (QLD), approved by the UK Solicitors Regulation Authority and the Bar Standard Board. It is the first step for students considering practising law professionally as a solicitor or barrister. Graduates are invited to attend a graduation ceremony at the University of Essex, Colchester Campus. This exciting day gives students the chance to reflect on their achievements and celebrate with family and friends. There is also no mention of online study on the University of Essex degree certificate; the mode of study is only mentioned on the transcripts that accompany your final grades. Being a QLD the LLB (Hons) programme covers all foundation modules including Constitutional and Administrative Law, Law of European Union, Criminal Law, Law of Contract, Law of Tort, Property Law, Equity and Law of Trust, and Legal Research. Along with these core modules this programme also covers a number of compulsory and optional modules. The modules are designed and delivered in a way that in addition to subject-specific knowledge, students will also gain a range of skills including advocacy skills, analytical and problem-solving skills needed to build a successful career in law or a number of other related careers. With our discussion forums, regular lectures, assignment deadlines and directed reading, students are required to put the same effort as study on-campus during their course of study for the LLB (Hons) degree. The University of Essex Online LLB tutors are solicitors, barristers and established law lecturers, and every one is more than qualified to teach law at the LLB level. Dr Naila Anwar, the Head of Law, was awarded a PhD degree from the School of Law, University of Nottingham (NU). Naila has worked as a lecturer and tutor at a number of prestigious universities, including Sheffield International College (SIC), Nottingham Trent University (NTU), Nottingham Trent International College (NTIC) and many more. Individual tutor support is provided to each of the students via email and telephone (plus feedback on assignments). Tutors run live Q&A sessions that allow students to communicate in real-time. We recognise that discussion is an important part of learning, especially for a challenging discipline like law, so our students are also graded on their contributions to our discussion forums. free access to an online library. Law opens up many opportunities for students to develop their careers, both inside and outside the legal field; this includes preparing graduates for roles in finance, human resources, education, local and central government, the voluntary sector or management. Our graduates also develop a number of transferable skills that they can use in almost any workplace, including communications, presentation, writing, analytical and critical-thinking skills. The Turnitin plagiarism detection software is adopted to monitor students’ work and if a submission is found to be in breach of University rules and regulations, procedures are in place to escalate the matter (which may lead to disciplinary action being taken). Approach towards online qualifications has changed in the last few years and with so much of our everyday lives now online they’re given the same respect as a traditional campus-based qualification. Same academic standards, rules and policies are applied to degrees delivered on-campus and online. The University is dedicated to improving employability amongst our graduates. Our online courses give you the opportunity to improve your career prospects and earning potential with a mix of key skills that are directly transferable to the workplace. Studying Law prepares you for a career in many sectors. Roles in finance, human resources, education, local and central government, the voluntary sector or management all benefit from a legal background. The LLB (Hons) Law online is recognised as a Qualifying Law Degree (QLD) in England and Wales and is the first step if you are considering practising law professionally. To be classed as a Qualifying Law Degree, you must also complete all your degree studies in not more than six years from start to finish. The minimum standard for a QLD undertaken for the purpose of completion of the Academic Stage for qualification as a barrister is lower second class honours. If you are applying for Accreditation of Prior Learning (APL), please check with the Solicitors Regulation Authority (SRA) or the Bar Standards Board to find out if this will affect the QLD status of your course. The Solicitors Regulation Authority (SRA) has announced it will be introducing the Solicitors Qualifying Examination (SQE). The earliest date for introduction is September 2020. The SRA will be providing information and guidance about how to qualify in the new system so keep checking their website. What other careers can I use it for? A law degree is an extremely valuable qualification, recognised by employers around the world. If you decide that you don’t want to practise law as a barrister/solicitor, you still have many careers open to you; roles in finance, human resources, education, local and central government, the voluntary sector or management all benefit from an academic law background. Alongside subject-specific knowledge, a law degree also helps students to develop transferable skills in a number of areas including research, presentation and critical thinking. What is a Qualifying Law Degree in the UK? Any law degree is a prestigious achievement, and a highly-respected qualification. However, if your ultimate career goal is to practise law professionally you won’t just need a law degree, you’ll need a Qualifying Law Degree (QLD). Here’s everything you need to know about this essential requirement. How do you define a qualifying law degree? What are the restrictions and requirements? 1. You must complete all your degree studies in not more than six years from start to finish. 3. You must pass a foundation subject without exceeding the maximum three attempts. 4. Deliberate academic misconduct may result in a person being refused admission as a solicitor. How do I use it to practise law? It’s also important to note that in order to complete the Academic Stage for qualification as a barrister, the student must achieve a lower second class honours as a minimum. What makes the University of Essex Online LLB (Hons) so unique? The University of Essex Online LLB (Hons) course is a 100% online, part-time Qualifying Law Degree. Our students study on a virtual learning platform, watching interactive lectures and using resources that are tailored specifically for online education. Online and part-time education is extremely flexible and allows students to work while studying. It’s perfect for people with demanding family or career commitments. Progress is monitored through assignments, which are frequently assessed and validated using a well-established electronic monitoring system to check for plagiarism. Our students are also assigned a dedicated Student Adviser who acts as a point of contact and mentor. We’re extremely proud of the student support we offer all of our students and we have consistently received outstanding overall student satisfaction ratings from the independent National Student Survey, scoring 93% for overall student satisfaction in the 2017 National Student Survey. Our Head of Law, Dr Naila Anwar, has many years’ experience, and has worked as a Senior Academic Tutor, Law Lecturer, Module Coordinator and Sessional Law Tutor at many distinguished UK universities. She is also an enrolled advocate of the Dhaka Bar Association and has worked as a trainee lawyer for the Human Rights Enforcement Agency, one of the leading NGOs. How can I become a Solicitor 怎樣能成為律師（事務律師）? Any person wishing to qualify as a solicitor must obtain a Bachelor of Laws (LLB) degree from the University of Hong Kong, the City University of Hong Kong, the Chinese University of Hong Kong, OR another recognized tertiary institution under Common Law jurisdiction (or pass the Common Professional Examination of England and Wales (CPE) for non-law graduates), and must obtain a Postgraduate Certificate in Laws (PCLL). You are also required to satisfactorily complete a period of two years employment as a trainee solicitor in order to be eligible for admission to practice in Hong Kong. How can I become a Barrister 怎樣能成為訟務律師（俗稱大律師）? Holders of non-law bachelor degrees can either complete the LLB course or pass the Common Professional Examination of England and Wales (CPE) before taking the Postgraduate Certificate in Laws. Applicants must undertake pupillage (similar to being a “trainee”) for six months in order to be eligible for admission as barrister. In order to practise, however, they must undertake pupillage for a further six months during which time they have a limited right of practice. click here to submit your enquiries online. All contents and information, including but not limited to forms and navigation links, are proprietary to Success Institute of Higher Education and Professional Training Limited (Success Institute) and are subjected to copyright protection. Republication, redistribution or unauthorized use of any content or information contained in this website is expressly prohibited without the prior written consent of Success Institute. offers accredited University programmes and practical professional qualifying training courses that are widely recognized by universities, professional bodies and employers.